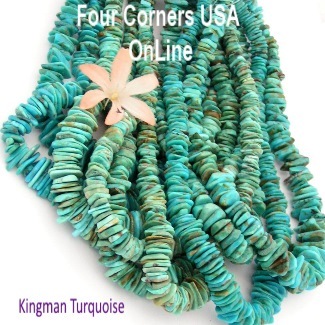 Specializing in American Kingman Turquoise Bead Strands for Jewelry Designers. Chunky Graduated Bead Strands, Blue Kingman Turquoise Round Beads, Rondelle Beads, Heishi Strands including Mohave Green, Mohave Purple and complimentary Apple Coral Beads for all your Southwestern Jewelry Designs. Offering a fine selection of Native American Indian Jewelry and Artisan Handcrafted Jewelry Gifts, American Turquoise Beads and Jewelry Making Supplies for the Creative Soul! Four Corners USA OnLine strives to make your shopping experience in our store positive and exciting with the discovery of new One of a Kind Treasures. Thank You for visiting Four Corners USA OnLine Jewelry Store! We hope you enjoy browsing our Catalog of Artisan and Handcrafted Native American Indian Jewelry and Turquoise Beads. Because our Jewelry is mostly all One of a Kind Creations and our Turquoise Beads are specialty limited quantity productions, our Catalog is constantly changing and evolving. . . . so check in frequently! Offering an eclectic Collection of American Turquoise and Southwest Native American Artisan Silver Jewelry consisting of unique one of a kind treasures from Navajo, Zuni, Hopi. Shop Four Corners USA OnLine Jewelry Store for an extensive selection of Dry Creek Turquoise, White Buffalo Turquoise and Navajo Inlay Wedding Band Rings, Engagement Rings, Bridal Sets and Bridegroom Wedding Bands in stock for immediate delivery. All dialogue and articles throughout our website are Original Written Content compiled over years of experience and information obtained through personal conversations and relationships we have maintained for over 20 years.